Leading global graphics card and motherboard manufacturer MSI today officially announces the world's first graphics cards equipped with the brand new AMD 28nm Radeon HD 7900 GPU, R7970-2PMD3G5, which is built on the latest PCI Express Gen 3 standard. MSI's R7900 series graphics cards are equipped with 3GB of high speed GDDR5 graphics memory, and also come with MSI's exclusive Afterburner overclocking utility that allows users to adjust the core voltage to increase overclocking potential. 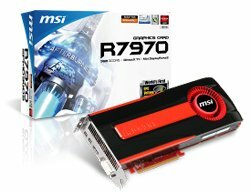 MSI's R7900 series also features AMD's exclusive Eyefinity multi-display technology, and combined with support for next-generation DisplayPort 1.2 and HDMI 1.4a interfaces, stereoscopic 3D capability, and 7.1 channel lossless high quality TrueHD and DTS-HD audio formats, consumers can enjoy the highest quality audio and visual entertainment! MSI's R7900 series graphics cards have also implemented an all-solid capacitor design to guarantee stability even when working under full loads over extended periods of time.